Bull is the newest member of the Atos family: a mutually beneficial union, with a strong and exciting future. With the Bull brand, we have new capacities. With 80+ years of technology innovation expertise, Bull is the hub of technology development at the heart of our Business Technologist family, as we compete on a global scale with Tier One companies. 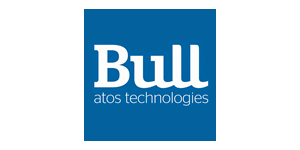 Like all of our brands, Bull has a specialized role within Atos, shown in its endorsement: ‘atos technologies’. Our ability to master technology development is consolidated, with an expertise in Big Data and Security. Together, we can embark on cutting edge technology projects that rival the human brain. The Bull brand launches its Exascale project – forging the bridge between HPC, Big Data and Security (including Cyber Security and Missions Critical Systems) to build computers that can process one billion billion operations per second, rivaling the complexity of the human brain. We are excited to be there together at the forefront. As a true member of the Atos family, Bull refreshes its visual identity. It adopts the Atos blue color and Stag font, with an endorsement to accompany the logo wherever it appears, completely in line with Canopy and Worldline, its sister brands. All Bull employees are now part of our Business Technologist community, fostering true innovation and forward thinking. We share the same dedication to close customer relationships, which is embodied in our vision: bringing together people, technology and business to power progress, as we take forward Bull products to our customers. All this comes together in Bull’s unique promise within Atos: extreme trust. Our customers know that, with Bull’s cutting edge products, they can move forward with total confidence, with the Business Technologists at their side.